I don't think with all that bracing that's gonna be true Shaun. It's simply run out of thread on the bolt. I agree that will fix the issue, but £20 plus delivery for 2 washers? I don't think so. I'll make some. Last edited by AGoaty; 04-08-2018 at 06:26 PM. That's what I have fitted to mine, just that I had to modify the subframe as it was one of Geoff's early ones and didn't have tower bolts welded to the frame, I've had to make a little spacer and a couple off washers at the bottom of the tower bolt else it tried to crush the cross member before the bolt was tight. So it appears I have been barking up the wrong tree with the tower bolt. I have got it tightened up but the metal to metal creaking noise didn't go away. I had to investigate further. I noticed the front left had dropped slightly. Wasn't sure why so took the wheel off to look. At first couldn't see anything wrong. So thought, I'd just wind up the adjuster a little. When I did this, the whole HiLo didn't turn concentric to the knuckle joint. It went so far then jammed solid. Hmm. Decided the only option was to strip it down to see what's up. 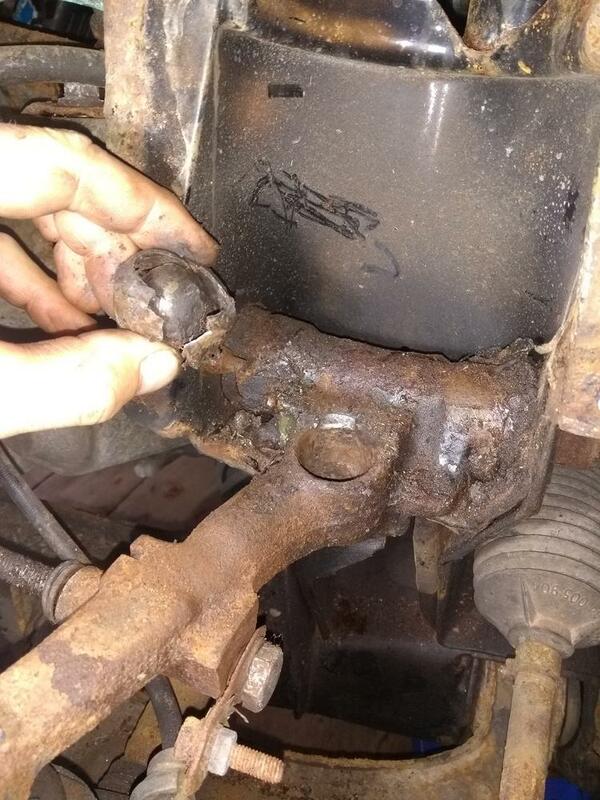 Removed the side plate (one bolt seized solid so had to grind it off) then prised out the spring which fell on the floor. Looked at the knuckle, it had snapped in two! Took some abuse but got the ball part out of the top arm. Been trying to think and cannot ever remember having a knuckle snap so started thinking why. Phoenix has always been bad with rough roads or speed bumps. It bottoms out on the suspension rather than hitting the bump stops. Looked at the arches and there isn't a mark on them. The wheel cannot physically reach it with the spring in place. The thing is, there is a gap between the bump stop and top arm when at full top suspension. This means it has never used it. The knuckle joint is the weak part so has snapped. On the second pic you can see that the shaft has moved to the edge of the hole and that was my noise. Tried the wheel on and wound up the suspension to see how high it will go before hitting the bump stop. Right into the arch! That's no use. So have made a bracket to fill the gap. It's not beautiful but serves it's purpose. Sorry, hard to see as blathered it in Shultz. Tested it again and there is now over 10mm gap from the wheel to arch. I have ordered some heavy duty knuckles (whatever that's all about) in order to get this done properly. Thing is, The other side has the HiLo that has seized so need to do it all again. Took Phoenix out for a drive . I found the ride has vastly improved changing the knuckle joint on the passenger side so have decided to swap the drivers one too and sort out the seized HiLo. Getting the spring out was fun as couldn't lower the HiLo bolt. Had to jamb a cold chisel in the top and prise out the spring. Once out I am not sure if I broke it or it was broken before but it came out like this. It's hard to see on my picture but there is a flat on the bottom of the ball. I fit these as a pair 8 years ago and the other isn't like that. Got the HiLo in the vice and had the breaker bar on it. I thought my vice was gonna snap off the bench but finally it has moved. Wound it up and down with a bit of oil and it now moves freely. 8 years?! Those knuckle joints were a pineapple design, they need changing with annoying regularity. And if the taper is worn, they'll need changing even more often. the genuine knuckle joints have a flat on the bottom - it's somewhere for the grease to sit. always get genuine (or unipart/delphi) knuckles if you can, the cups last much longer. These are not the taper type. They are the straight shaft that goes into the suspension HiLo or trumpet on original design. The ones I have bought say heavy duty on them. Not heard of the make though so only time will tell. Did the new type look heavy duty in any way? They look identical to any other but it says heavy duty on the box so it must be true! In reality, you wouldn't know if if was made of stronger materials. Only time will tell. I was hoping the cups were going to be noticeably better quality. I expect the “special” ones that come with genuine hi-los are no better than regular ones and will wear quickly, hopefully they’re of some quality. They’re the only bit that fails on them mostly. I do realise that when you actually use these cars, things go wrong but having a bit of a nightmare with this at the moment. So I cleaned out the hole for the knuckle. I thought the bottom of it was the remaining plastic from the cup, but it was just muck. Got a screwdriver in and removed all that only to find this. The knuckle must of worn through the cup and has started to wear the top arm. it must of just started as I can just feel a small amount of wear in it. Surprisingly, it didn't make any odd noises. I have cleaned up the hole enough to get the knuckle in and hoping for it to seat properly. It's not a hard job to do to be honest if it's not right. Fitted the spring and HiLo with plenty of copper grease. Picked up the shocker and pushed it in to test it. The damn thing locked up solid! I cannot even pull it hard enough to open it. Last edited by Artstu; 24-08-2018 at 03:05 PM.